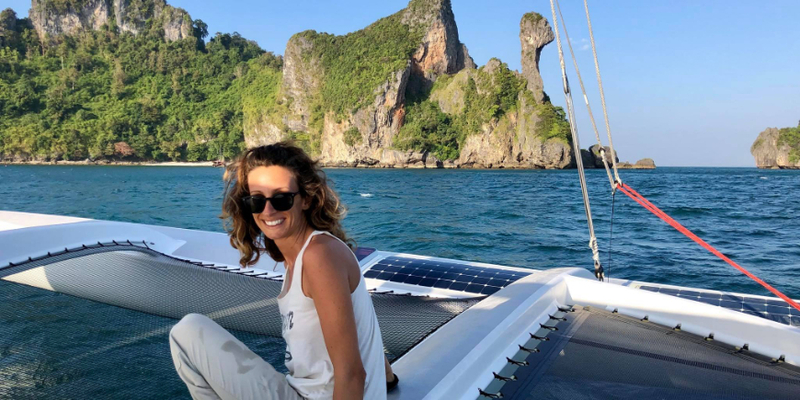 A couple that live on an ex racing trimaran since 2010, they are Jason and Claudia, owners of Spirit, and we asked them a few questions about their cruising life and how solar panels affect their experience onboard. What kind of boat do you have and how long have you been living in it? We have an ex racing trimaran. She was originally designed for the formula 40 class and was called Spirit of England. She’s now named Spirit and we purchased her in 2010 from Stonington in Connecticut in the USA. Spirit has been our home since then. What is the most important aspect of your cruising lifestyle and why did you decide to cruise? We’d have to say the freedom you get from living on the water is why we love it so much. I was brought up living on a yacht with my parents so it came naturally. Claudia was from Trento at the bottom of the Italian alps so for her it wasn’t so natural, luckily she never liked the cold and now here we are. We’ve both found within this life style a perfect compromise between different cultures, nature and sailing.. what tops it off is that we can also live totally off grid. 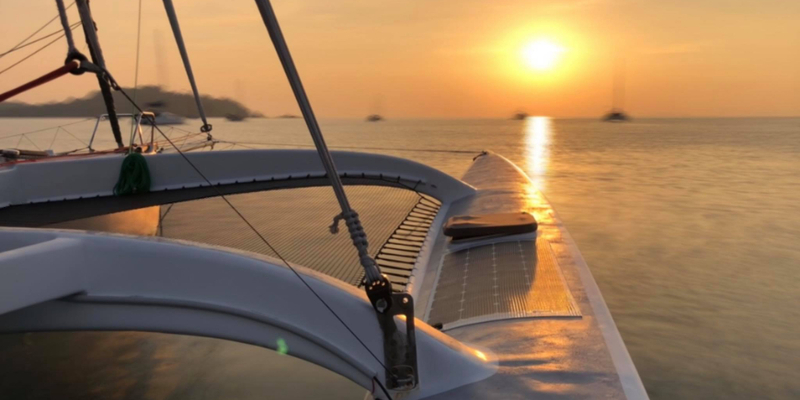 What’s a memorable moment that you have had on your trimaran? Sailing between reefs with only a few hundred feet either side of the boat. We did this when sailing up Australia’s East Coast in between the Great Barrier Reef and the coast. It was a magical experience ghosting along in flat crystal clear water with fish, turtles and reef right next to us. Is there anything you miss about living on dry land? Being closer to family and friends is something we miss and also we miss being able to exercise more easily as Spirit is incredibly small. Do you have any funny or scary moment on board to share with us? 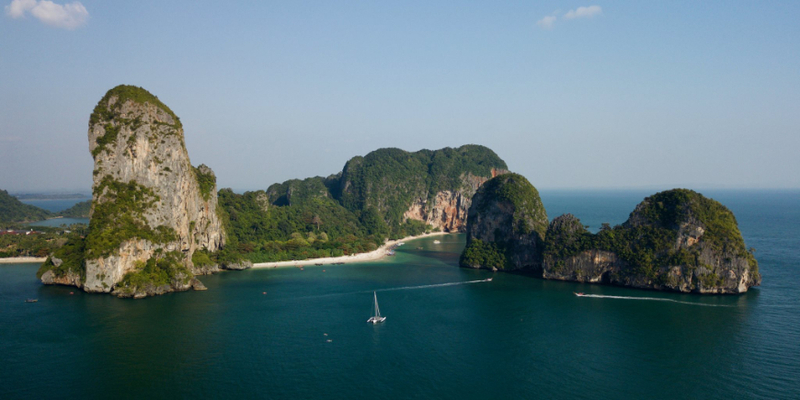 Last season in Thailand our good friends were anchored directly behind us and were hit by lightning. It was an experience we’d rather not have had as it was quite frightening and their boat sustained a lot of electrical damage. Luckily no one was hurt. How do you decide what is essential for cruising life and what is unnecessary? This is something we give great thought to. As we have an extremely limited amount of space we have to utilise it well. This means only having things in your life you truly need. It’s great though as it makes you far more conscious and you learn what really matters in your life. It’s a liberating experience. Your life becomes more simple in every way! From the begin we try to buy things that are efficient, choosing the best quality and also items that have more than one purpose where possible. Such as items that use the same rechargeable batteries and charger being one. How do Solbian panels affect your life onboard? Our Solbian panels are everything to us. They give us the ability to live 100% off grid no matter what the weather or location is. They supply the power that makes our water, charge our electronics, heat our food and let us live the simple and free life we have always dreamt of. Without them we would have to use fossil fuels and have a generator onboard, which goes against everything Claudia and I stand for. The first thing we did when we refit Spirit at the end of 2014 was to work out what we really needed to have onboard to be happy. The list was minimal but it gave us a solid foundation to build our design upon. We knew what size battery bank we’d need and also what size solar we’d need to keep those batteries charged. We aimed to produce all our power from solar but not having done it before we weren’t sure if it was possible. Because solar was our only method to produce power we knew we had to have reliable and efficient equipment to do this with. After studying different panels and how they are made we decided to contact Solbian. With Solbian’s help we finalised the size and type of panel that best suited our needs. The panels are then wired to Victron MPPT regulators which then supply the charging power to our 320Ah of lithium batteries. We’re pretty relaxed when cruising. As Spirit is so simple she requires virtually no maintenance, so our days are free to do as we please. We start slowly with a swim and walk ashore if we’re somewhere nice. Then have a fresh juice, which we do every day. Claudia and I try and be conscious of eating healthy so there’s lots of fruit and vegetables in our diet. I’ll check the batteries and then make some water for an hour with our water maker. I might swim and clean the bottom of Spirit while Claudia cooks something in our solar oven, which is called GoSun. We’ll read for an hour and catch up on emails to friends and family. By the time this is all done it’s near sunset and we enjoying the hammock.